You know who isn't going to stand for your bullying? Chaldira Zuzaristan, that's who. This halfling demigoddess jumps fist-first into tyrants and oppressors, showing her followers how quick action, trust in luck, and faithful friends can see you through any trouble. Chaldira's worshippers can rely on powers that bolster their fortune and enable their light-hearted mischief. Sure, she's got a paladin code, but when your paladin code includes "It is my sacred duty to explore" and "I know mischief brings joy," you know you'll have a character that can find two fistfuls of trouble. My favorite part of writing Chaldira's entry was bringing her attitude through in the writing, and into your game! So, I got to the write-up on Nivi Rhombodazzle, which makes it hard to nail down one particular part that's my absolute favorite. I mean, the gnome goddess, who is almost perfectly described by Kenny Rogers in the song "The Gambler", what's not to like? But since I have to choose something… I loved writing up Nivi's planar allies. While some of Nivi's allies, like her sapient magical die Seven-Eyes, had already been briefly mentioned in previous works, it was still fun to build out the details of these figures that represent some important aspects of Nivi's personality. Maybe I'm a bit too fond of talking animals (I did read the entire Chronicles of Narnia at least a dozen times as a kid) but I also had to add the earth elemental Rummbrrlar, in no small part because I want to use him in a Pathfinder Society scenario at some point. A powerful elder earth elemental who spends most of its time in the shape of a mole made out of diamond, riding around in adventurer's backpacks dispensing sage advice that would have been most useful about five minutes earlier, just leapt out at me as the kind of individual Nivi would take a special liking to. 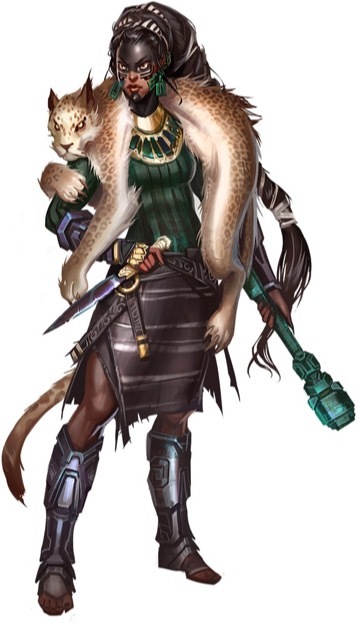 I hope everyone else who loves Nivi as much as I do finds something worthwhile in this article, and that you all have some fun bringing Nivi's faith and lore into your Pathfinder games. I know I did! 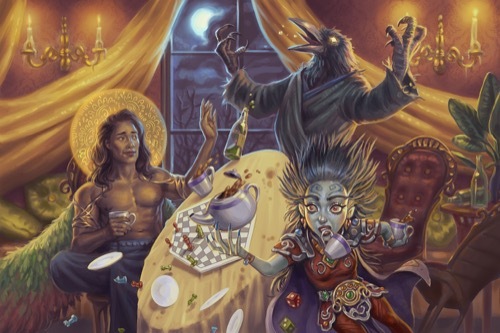 Much as the Glory domain's mechanics lend themselves to good-aligned deities, the Madness domain seemed nearly exclusive to evil divinities in early Pathfinder. This style of madness hearkened to the slavering beasts, wild psychopathy, or sinister misanthropy presented in many scary movies. A few years later I read about Tsukiyo in Pathfinder Campaign Setting: Dragon Empires Gazetteer, and I reread it in puzzlement for a while. Lawful good madness? How could this be? The more I considered him, though, the more I understood what might have happened. Tsukiyo's story is similar to that of Osiris in Egyptian mythology: killed by a jealous rival, mourned by his lover, pieced together by divine mysteries, and brought back to life. Whereas Osiris changed in body (having been embalmed in some versions), Tsukiyo had changed mentally. His love for Shizuru had not dimmed, nor had his power diminished; however, he was shy, reserved, and seemed to process the world around himself in a strange way, puzzling his bold and boisterous peers. Yet Tsukiyo overflows with compassion for mortals, especially those whom societies deem insane. He doesn't have the Madness domain because he revels in inflicting psychological distress. He has that domain because he defends, comforts, and above all understands the neurodivergent. 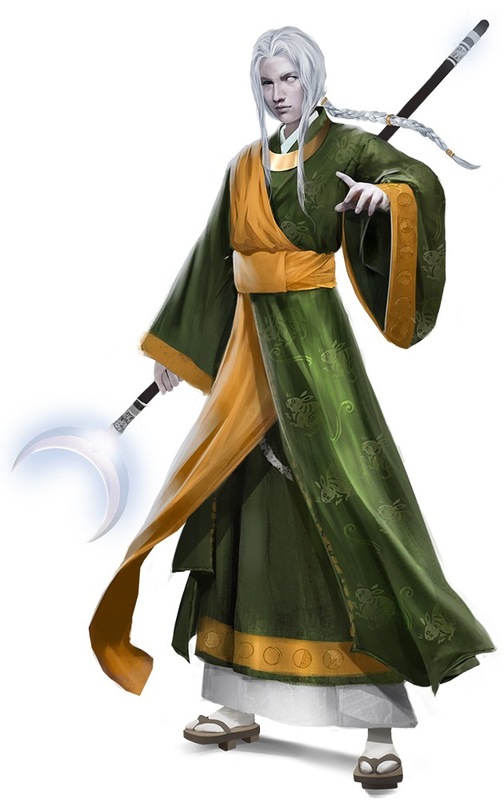 Creating the codes for his priests and paladins was an absolute pleasure, as was working with Liane Merciel (author of the Shizuru article) to describe his difficult yet utterly devoted romance with Shizuru. Some of my other favorites include Grandmother Spider, Achaekek's little sister, who much like younger siblings everywhere likes to play pranks on her big brother… as well as everyone else! In fact, she even managed to steal and copy Asmodeus' keys, an embarrassment that the Dark Prince hates other people knowing about. There's also Gruhastha, whose beautiful features were cited by a coworker as "one way to get people interested in reading." A former mortal, Gruhastha really put himself into his writing—so much so, that he actually became one with the text. I'm sure other authors can sometimes relate. I love this illustration of Kazutal!!! And Tsukiyo is also incredibly depicted, especially for the rabbits in his robes. Some of my other favorites include Grandmother Spider, Achaekek's little sister, who much like younger siblings everywhere likes to play pranks on her big brother… as well as everyone else! In fact, she even managed to steal and copy Asmodeus' keys, an embarrassment that the Dark Prince hates other people knowing about. I really feel like this is something people should pay close attention to, given that one of those keys goes to the prison of a certain Rovagug the Rough Beast. Anyone else feel like when it comes to potentially releasing an all-destroying monstrosity, there are two keys too many? So ASMODEUS the Ruler of Hell, should have the only one? I say no, no he should not! I said two keys too many. The copy and the original should both be long gone. The art in this book is absolutely gorgeous, definitely a high mark in Paizo's art repertoire. Thank you for the Tsukiyo write-up, Compton. Scene: A party of adventurers arrive in an ancient, crumbling temple. The rogue brushes aside spider webs, and holds up his torch, peering at some ancient text on the wall. Wizard: "What does it say?" Rogue: "It appears to be dedicated to Kazutal, Goddess of Safety. It says 'Beware, he who would run with scissors, for it is dangerous, and injury is likely.' Wait! There's more. 'Always swim with a buddy, and not until 30 minutes after eating.'" This is a really great book with wonderful art.